Each of Nani’s guest rooms is stylishly appointed with fine fabrics and linen, imparting an aura of comfort. Original artwork adorns the walls in the 28 lavishly appointed rooms, which includes 2 distinctive Suites, 6 Executive Rooms and 20 Deluxe Rooms. Rasika Ranjini, our spacious conference hall accommodates up to 230 guests. 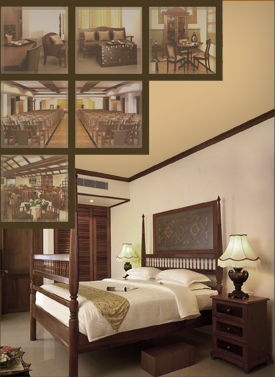 It is equipped with cutting edge sound system and conferencing facilities. It also serves as an ideal space for private parties and functions. A plush, well appointed Business Lounge with a picturesque view of downtown Kollam is made available exclusively for the in-house guests.. It is a perfect place to have a private business meeting with a personal attendant on call. Nani houses a fully equipped Business Center with high speed Internet access and data port. Fax and photo copier facilities are made available for the in-house guests. Breakfast, Daily Newspaper, Packaged Drinking Water, Shampoo, Moisturizer, Soap, Shoeshine, Pencil & Scribbling Pad, Pen, Shaving Kit, Dental Kit, All Purpose Kit, Comb, Shower Cap, Shower Gel. Doctor on call, Wakeup call. Tour package, Taxi service, Laundry, Local sight seeing. Central Air-conditioning, In-room Electronic Safe, Flat Panel TV, Cable Channels, Wifi, High Speed Internet Access (for a fee), Mini Bar, Mini Snacks, Coffee/Tea Maker, Room Service (24 hrs), Wake-up Call, Guest Laundromat, Deluxe Bath Amenities, Hot Shower with shower enclosure, Bath tub & glass shower enclosure in suites, Shaving Kit, Concave Mirror, Hair Dryer, Iron Board & Iron Box.